Wow... another year of Believe in the books. I have honestly lost count on how many I have been to over the years. I bought a sweatshirt that said BELIEVE - Est 1997. Well, I was at Believe 1997 so there you go... 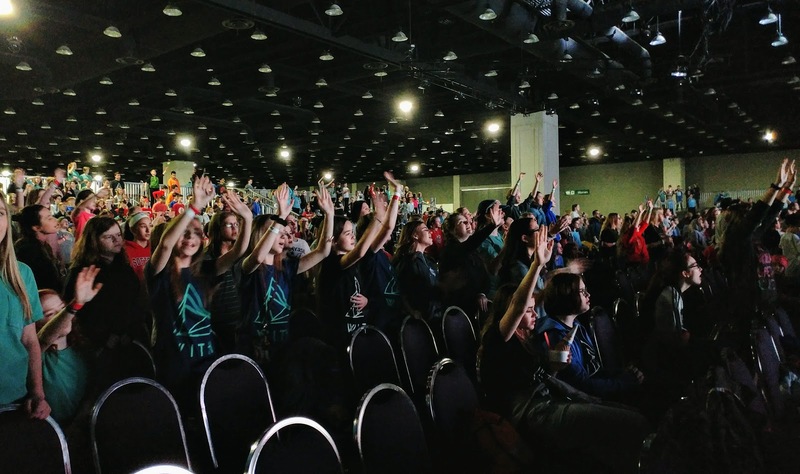 I know I've been to other youth conferences before - I guess those weren't called Believe... see how I've lost count? All of that to say, I've been doing this for a LONG TIME. It really freaks me out because I was thinking of that.... even if we just go back to the beginning of this. Those kids were anywhere from 11 to 14.... they are now 21 to 24.... OH MY GOSH. Adults themselves. More importantly - where does the time go? Friday kicked off with me running late. Dang it. I got off work early but still had to run home & wasn't packed. That was my downfall. But I still got there right before the kids did - whew! 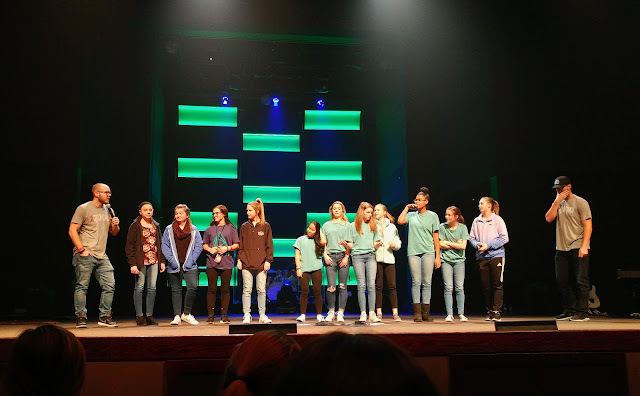 It was funny because my group was originallly supposed to have 18 kiddos - but after more girls from my night time bible study got there & found out they were in another group - they asked if they could be switched... 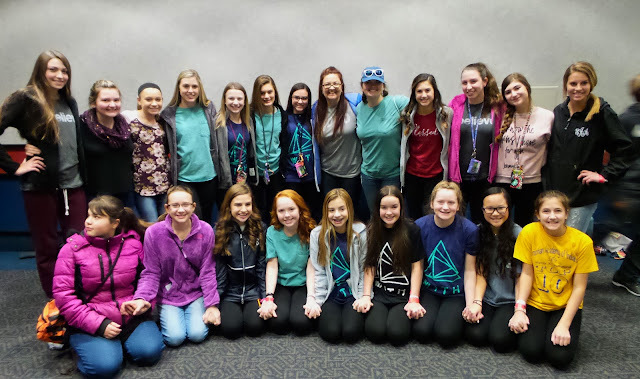 I ended up with 21 girls... That's some "small group"
But honestly - these girls are so great... we really did have an amazing small group time. Some great discussions - some big emotions - some amazing talks. & they are all respectful of one another - listening to each other & not talking over each other... they are the best. Truly the best kids ever! & we had some great lessons on how we need to remember how God is so near... how we dont have to work towards to earn that relationship with God - He is pursuing US... we need to just remember that & know that not only that He is WITH us - He is WITHIN us... He gave us the Holy Spirit as a reminder that He is always near. Never leaving us. There was a great story the speaker gave where he parachuted out... they gave him the lesson on what to do & showed him where the cord was to pull - YOU CANT MISS IT - it was pink with a golf ball on it - right on the chest - YOU CANT MISS IT.... except when he jumped, he panicked & he couldnt find it. Totally convinced he was going to die. & then the hand came around him to pull the cord for him. He was so lost in the panic, he forgot he was in a tandem unit & there was someone on his back who was in control. There was someone in charge - someone who was going to make sure he was safe in this. ... such a good visual story. 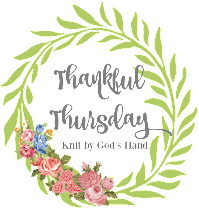 I loved it too because SO MANY TIMES.... they referenced that God being with us because He created us - KNIT US! He was the one who KNITTED US IN THE WOMB... I felt like standing up every time they said it & being like REPRESENT!!!! 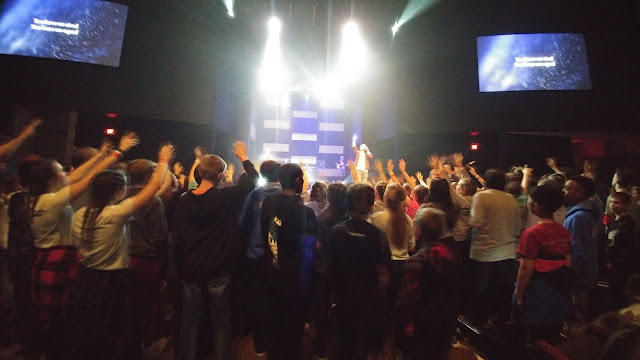 & the worship is always amazing.... these kids FEEL it... they are so free to worship in a way they dont any other time. 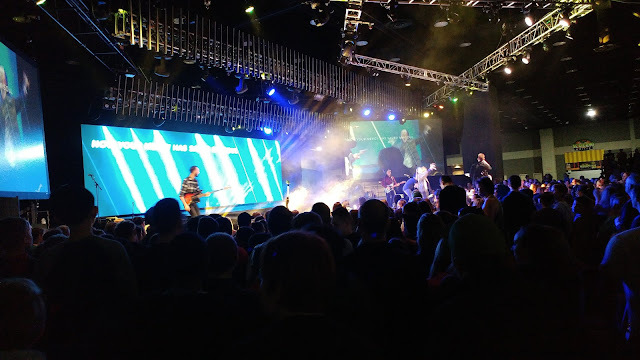 The kids even told me they love going up to the front where everyone crowds & they dont even know the person next to them but they love worshipping with these 'strangers' - just knowing you all have a connection because you're worshiping the same God together. Such a special feeling. Of course, I was a little on the freaked out side with all the flu stuff going around & it seeming like the world is sick. I was QUEEN of the hand sanitizer. & then Saturday morning, one of my girls was like, "go to the bathroom with me - I think I'm going to be sick"... well, indeed she was. She threw up TWICE. Talk about a panic attack coming in. I called the nurse & the nurse checked her out & sat with her for the afternoon. She thought it may be some sort of food allergy or anxiety thing because the girl never ran a fever & totally acted fine the rest of the evening - dancing, jumping, eating a salad... but I was freaked out & kept the sanitizer flowing. 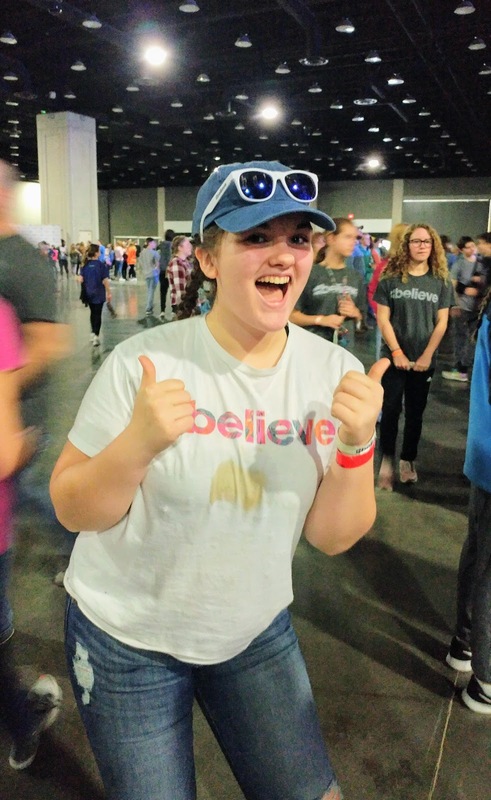 & even worse, another leader from another church passed OUT on one of my youth kiddos... spilling his coffee in the meanwhile all over her... AND thank God she was there - he would have hit his head on the hard concrete. But he was sweating with a fever - told the nurses when they got there that he has the FLU.... OK - let's stop for a second - WHYYYYYYYYYYYYYYYYYYYYYYYYYYY would you come to a youth conference if you knew you had the flu??????? COME ON PEOPLE... & we wonder why the flu is an epidemic right now? I was so angry about this. Like LIVID about it. The nurses put a mask on him immediately & they got him out to go to the hospital. I told my MSM girl to take that shirt off & BURN IT. We got her another shirt & I about doused her with sanitizer too... UGHHHH - all the sickness. 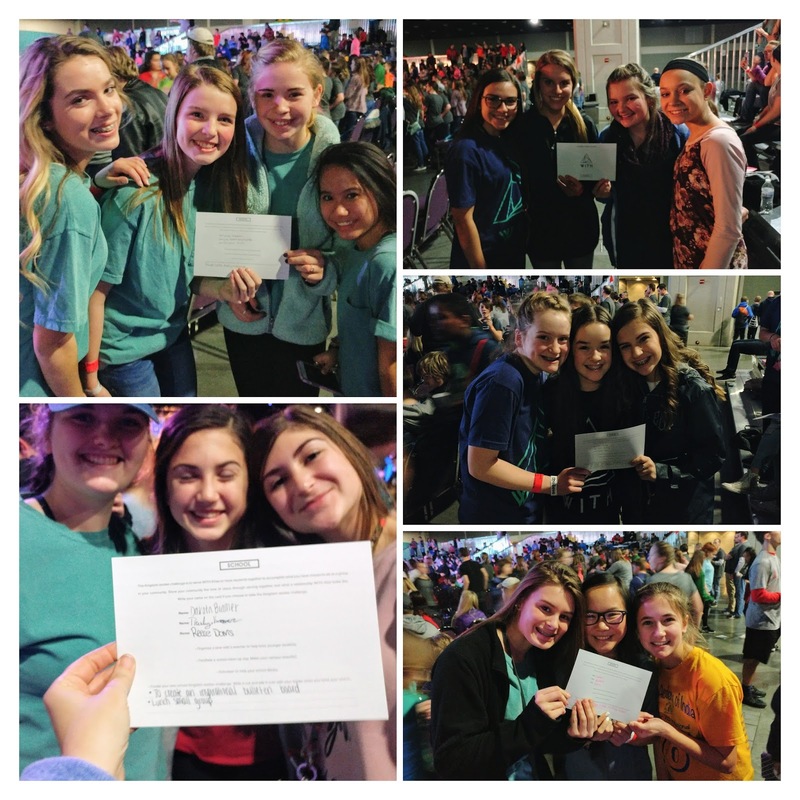 The best part of the weekend was these kids making choices & decisions on becoming Kingdom Workers - what CIY calls it to promote following through weekends like this - decisiosn on what you're going to do NEXT....put your faith into action to change the world. The challenge was to do this in group of 3's - accountability.... they went to different areas to see where they were going to decide what they were going to do. They brought their decision back to me & we prayed over the things they wanted to do together.... I LOVED THIS PART OF THE WEEKEND. We headed back to church to break down the weekends events... & found out 3 people decided to commit their life to Jesus... YAHOOOO!!!! & about a dozen are rededicating... A successful weekend! GO GOD!!!!! & then it was time for a Talent Show. & next thing I know - I have a group of girls running up to me to ask me to dance with them. I thought they were joking. These girls dance. Like seriously dance every weekend in competitions - I told them to just do it on their own & they refused - they said I HAD to do it with them. & then they showed me a routine... & next thing I know - we're starting the talent show in 15 minutes. Ummm.... what's that routine? HAHA - they didnt even care. They were like, freestyle the whole time - we dont care - we just want you up there. I LOVE THESE GIRLS. So I have no problem making a fool out of myself for them. I just kept telling myself - its all about memories. I want these girls to grow up remembering they had someone who loved them so much, they just wanted to have fun. There's no cares in having a good time together. I want these girls to always remember our friendships & relationships when they think back on this weekend. & then we went into the sanctuary for our CELEBRATION SERVICE. & to get to worship one more time together. Its so hard to put into words weekends like this. They are so individual. God speaks differently for every single person. But the fun & relationships that come out of these weekends are just the best part of it all. Even when you get 3 hours sleep & you eat junk all weekend - & your feet are killing you - & you deal with puking kids - & make a fool out of yourself.... it's all worth it. & you look forward to the next year. You are such a Christian role model to these awesome girls! I am so proud of you! What an amazing event! I use to go to events like this when I was in Middle school (although it was not called Believe), and I loved them! Time really does go by so fast, doesn't it? This year, I had a substitute teacher in for me and it was a student I actually had in my class the first year I started teaching here! How's that for feeling old? What an AWESOME experience!! I absolutely loved the clip of your dance on Insta, and the whole thing is even better! You just look like you're having so much fun (despite all the scary sickies floating around). Have the best week! Sounds like a great weekend! I can't believe that someone came to the event even though they knew they had the flu :( I hope that you all stay healthy! I love that you brought your knitting! Seeing people you knew as kids as adults is BIZARRE. God bless you for being willing to put yourself out there. Those kids will never forget that. It sounds like such a wonderful event!!!! I would have been really upset with the dude who showed up with the flu too. Like you said, this is why it is an epidemic!!! People should not be out in public spreading that nasty around! I am inspired by you, I love these stories and I love the difference you are making in the world!! Wish there were a zillion Rebecca Jo's cause you're pretty awesome! It sounds like it was a wonderful event. There should be more people like you in the world. These children will never forget you. It is SO RUDE and THOUGHTLESS to go out in public when you are very sick and contagious. Loved seeing you up on stage! You rock! I loved that you got on stage with the girls and I'm sure they loved it too! What a wonderful 'soulful' time you all had. God bless you for your work with your girls! What a fantastic weekend! And what, you can't dance? That was WAY better then I could ever do. I love that you are helping to create such wonderful, lasting memories for these girls, trying to navigate through life. SO WORTH IT. It's amazing how God draws near to us, how He saves us and calls us with His incredible mercy, and I can see God working through you to disciple and love these girls in such a special way. It's like the Titus 2 mentorship happening right there. :) Love seeing your heart for all of these spiritual daughters in Jesus. It looks like you had an amazing time! 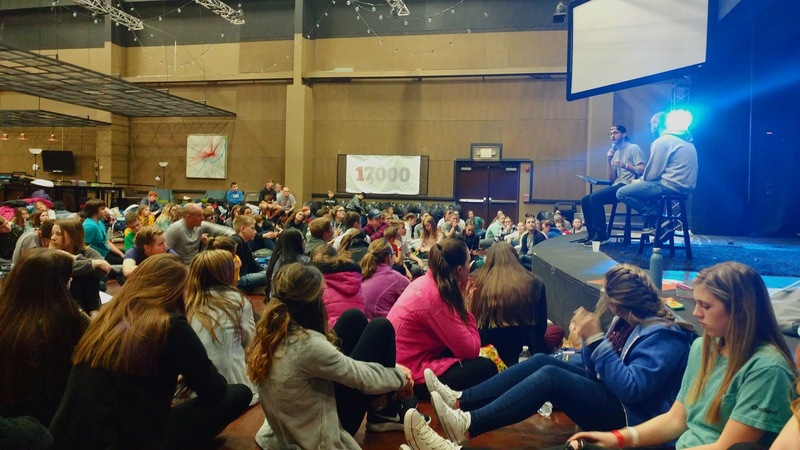 What a glorious weekend to see those kids make decisions for Christ. Life-changing!! What an amazing weekend! It sounds like it was a powerful one, minus the crazy that came with the flu, I am praying no one else gets it. I loved the video you shared of you dancing! You have some moves! Man, I'M mad about the guy with the flu. So rude. It sounds like you had a wonderful weekend!! What a special event for you all! !